Opener arrived with mild weather and no ice on the lake. The fishing was good but nothing like the prior two years when boats were being used as ice breakers and the walleyes were pre spawn. There were a good number of slot walleyes caught and a few just over the slot in the 27 and 28 inch range. With the warmer water and early ice out the bass and northern were more active than usual. The walleye fishing has stayed consistent through May but mostly with smaller ones for now. As the water warms and the big females recover from the spawn we should see more activity in the larger ones soon. There was also reports of a good number of very large crappie being caught earlier in the year than normal, we hope that activity continues. Most everything has been caught on minnows but I’m sure the leaches will start working soon. We are looking froward to a great June through September fishing season. 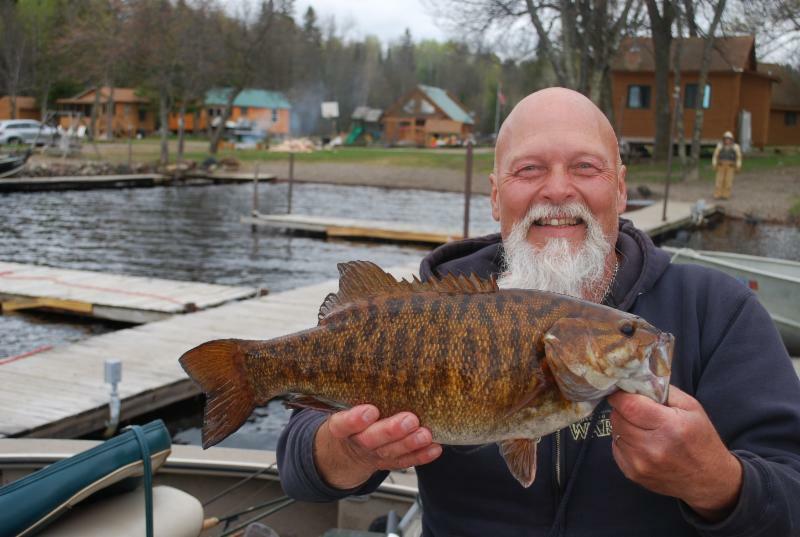 Mike from Iowa caught this awesome 22 inch Smallmouth during opening week. He also released it for someone else to tangle with.